The armature is denoted by a circle with two brushes. Mechanically it is connected to another device called prime mover. The two ends of armature are denoted as A1 – A2. The field winding is shown near armature and the two ends are denoted as . The field winding is shown near armature and the two ends are denoted as F1 – F2. The representation of field very little bit, depending on the type of generator. The symbolic representation is shown in the Fig. 1. Many times an arrow (?) is indicated near armature. This arrow denotes the direction of current which induced e.m.f. will set up, when connected to an external load. 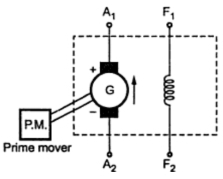 Note : Every practical generator needs a prime mover to rotate its armature. Hence to avoid complexity of the diagram, prime mover need not to be included in the symbolic representation of generator.